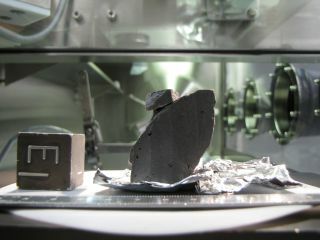 An Apollo moon rock sample in the Lunar Sample Laboratory at NASA's Johnson Space Center in Houston. Some of the moon soil collected by Apollo astronauts has deteriorated significantly during its four-plus decades on Earth, a new study reports. Scientists found that the median particle size in a set of 20 different Apollo soil samples held in laboratories for research use has decreased by more than half since the samples were first measured 40 years ago. Between 1969 and 1972, Apollo astronauts brought 842 lbs. (382 kilograms) of lunar rocks and dirt back to Earth. Eighty-three percent of that material remains unexamined in nitrogen storage at NASA's Johnson Space Center (JSC) in Houston, Cooper told Space.com via email. The other 17 percent has been allocated to researchers for study in a number of different laboratories. The 20 soil samples Cooper and her team looked at belonged to this latter group. Between 2007 and 2012, they used laser-diffraction techniques to measure particle sizes in the samples, which were provided by JSC and the University of Tennessee in Knoxville. The researchers compared their results with the original soil measurements, which were made in the 1970s using sieves. The differences between the two datasets are stark. For example, the median particle diameter has decreased from 78 microns (0.0031 inches) to 33 microns (0.0013 inches). And in the original sieve data, 44 percent of soil particles were between 90 and 1,000 microns (0.0035 to 0.039 inches) wide; today, just 17 percent of the particles are that large. The most likely explanation for the degradation is damage caused by water vapor, the scientists say. "Leaching by water vapor causes the specific surface area of a lunar soil sample to multiply, and a system of pores develops," they wrote in the study, which was published online last week in the journal Nature Geoscience. "These structural changes may be attributed to the opening of existing, but previously unavailable, pore structure or the creation of new surfaces through fracturing of cement or dissolution of amorphous particles." The new results suggest that the Apollo soil samples being studied by scientists are not pristine, Cooper said. "People should not assume that the Apollo lunar soil samples remain representative of soils found in the natural environment of the moon, especially if they have been exposed to air," she told Space.com via email. "In addition to particle size distribution, other geotechnical properties (such as strength and cohesion) must also have changed. Also, for example, water found in the sample might be taken to be lunar in origin when in fact it is the result of contamination." Cooper suspects that all of the researcher-allocated material has been altered to some degree. The unexamined samples may not be completely pure, either. "Based on other evidence, it's possible that even the samples stored in nitrogen may be compromised," Cooper said. There is no known way to restore degraded samples to their previous state, she said, adding that off-Earth storage is likely required to keep extraterrestrial material 100 percent pristine. "To store future samples so that they are not contaminated by Earth’s atmosphere, we need a facility like the International Space Station (with samples stored outside the pressurized area and examined robotically) or a similar facility on the moon," Cooper said. "If such a facility existed, new lunar samples (and samples from elsewhere in the solar system) could be stored with far less risk of contamination."